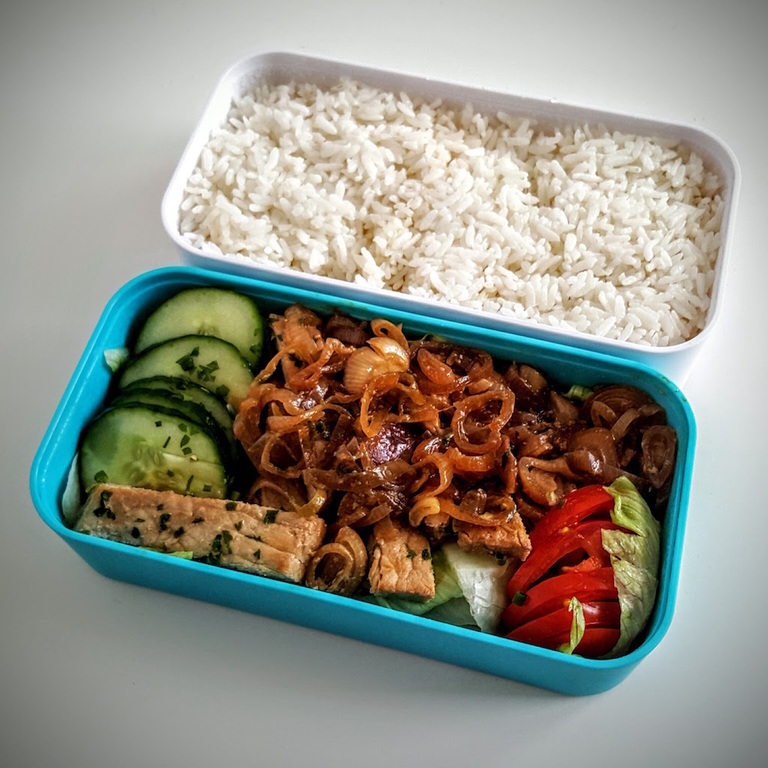 You will need rice cooker, frying pan, meat tenderizer, metal or glass bowl for marinating, and of course bento box. One by one place each meat slice on a chopping board and then gently smash 3-4 times each side with the meat tenderizer. Don't put too much force to prevent breaking the delicate meat. Cut each shallot alongside, then into thin slices, or just slice them thinly. 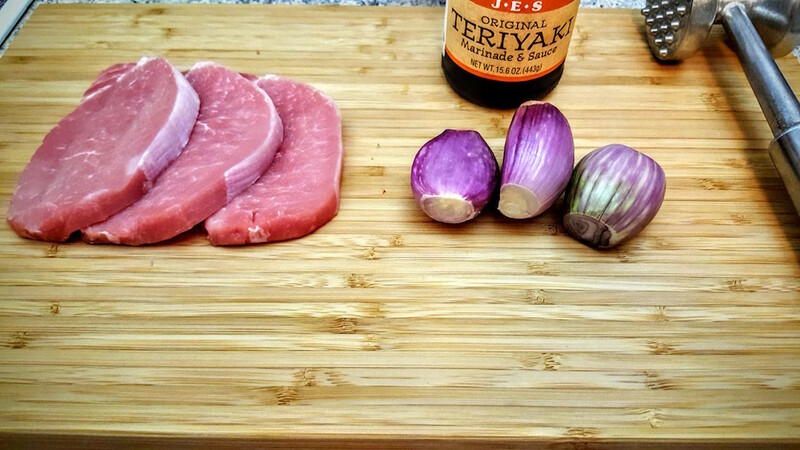 Place meat and shallot slices in the bowl and pour teriyaki sauce over them. 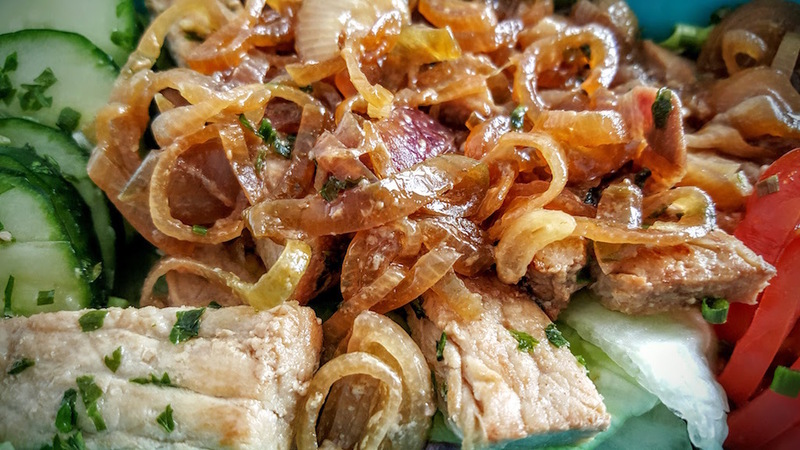 Distribute the sauce evenly over the meat and shallots with your fingers, cover with a plate or plastic wrap and set for marinating in the fridge overnight. Wash rice and cook like you usually do in a rice cooker or a pot. You can do other things while the rice cooks. 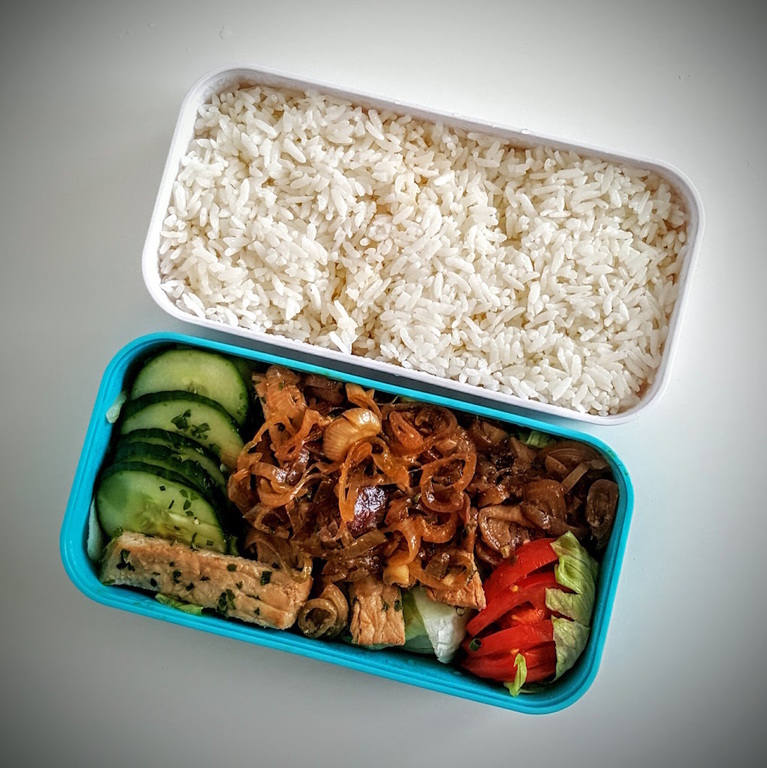 When rice is cooked fill the bento container with it and set aside to cool down. Heat heavy-bottomed frying pan on a high heat and warm oil on it. Then, using tongs, chopsticks, fork or simply fingers, pick each slice of meat from the marinate bowl, put them all at once on the hot frying pan. Let them brown for about 2-3 minutes until golden-brown from one side. You can sprinkle them with salt and pepper if you wish. Flip each meat slice and let them brown for a minute on a high heat. Don't stir! Take meat off on a small separate plate, turn heat to medium and pour rest of the marinate onto the pan. Stir often and cook until shallots are glassy and soft. Add rest of the spices: salt, pepper and garlic powder. Kill the heat and stir from time to time. Clean, dry and shred lettuce. Place in the bento container, then sprinkle with mozzarella cheese. Clean and slice tomato and slice or ditch cucumber. Place in the bento container on the side. Slice meat pieces into 1-1.5cm slices and place on the mozzarella-sprinkled lettuce. Pour shallot sauce over the meat. Your delicious bento is ready!